Historically Orange County has been agricultural. However, on the edge of the Great Depression, Orange seized an opportunity that was to provide the salvation of many farms and families. Milton Rubin, a Yankee entrepreneur looking for cheap labor, posted a call in the New York Times looking for a southern town interested in developing a silk mill. When asked why he chose Orange County, his reply was that, “The people here were so nice to me.” American Silk Mills Inc broke ground in 1928. The combined cost of building and machinery was reported to be more than half a million dollars. The Mill has its own water tower and approximately 6 acres of land. On May 30th, 1929 the first consignment of raw silk was delivered to Orange. It was imported from Canton China. The limited workforce consisted of 200 employees at the rate of approximately 15 cents an hour; many were able to provide their families with an income of $30 a month. Shortly after the mill opened, the Great Depression began in October of 1929. Because of the American Silk Mill farms were saved and a community was left intact. Beyond helping local farms and families survive the depression, the American Silk Mill provided a product vital to our nation’s success in WWII. American Silk Mills Inc was the nation’s largest producer of silk for parachute cloth during the Second World War. Three shifts of employees working 7 days a week were part of the war effort. More than 1000 employees took part in the project which won a Presidential Citation for their part in making parachutes. Why did the Mill close? It became impossible to buy raw silk as the war progressed. Most of the materials came from the Orient and was controlled by Japan. Consequently, many synthetic fibers came on the market such as Nylon, Rayon, and Dacron. The Mill was not designed for these new materials and the local plant was unable to compete. The mill closed in 1979. But true to form and unlike many abandoned mills on America’s east coast, the property was purchased in 1989 by visionary local entrepreneur Kent Higginbotham. Since then extensive renovations have been made to accommodate the various businesses here. 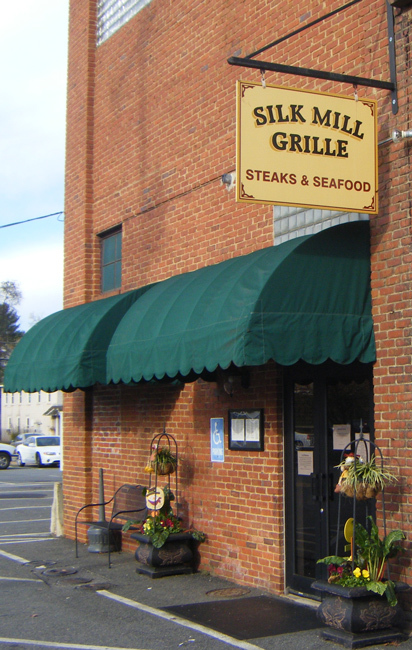 Our restaurant is located in what was the weaving department of the mill. Please feel free to take a look at our historical photos and equipment from the Silk Mill Era.